Ever wanted to eat at a steak restaurant, but afraid that you will walk away with just an empty wallet and a bulging stomach? If that's you, the owner of the Karin restaurant group, Goro Ishizuka, had you in mind when he recently opened 'Steak Karin' on the 2nd floor of the Carnival Park Building in Mihama. Here, for only ¥500, you can sit down to a delicious meal of rice, salad, and 100 grams of juicy beef rib steak, chicken pepper steak or Hawaiian pork steak. 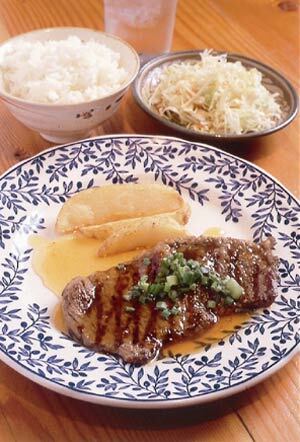 If that isn't big enough to satisfy your appetite, you can order larger 200g steaks for ¥880 or 300g for ¥1,280. The restaurant also offers a wide selection of beer, drinks and single dishes including fried chicken, onion rings, marinated salmon, assorted cheeses, and more, all for a reasonable price on the simple menu. All cocktails on the menu cost ¥500. 'Curry Karin', also on the 2nd floor of the Carnival Park, opens on April 24th. Its menu lists seven different kinds of curries. Customers can choose between beef, pork, green, pork cutlet, vegetable, Okinawan and fried shrimp curries. Each of the curries costs only ¥500. The Karin restaurant group has now expanded to a total of four Karin restaurants in the Carnival Park. In addition these, 'Pasta Karin' serves a delicious assortment of pasta, all for only ¥500. 'Japanese Karin' serves mouthwatering donburi (a bowl of rice with your favorite topping on it) all for only ¥500 as well. "I want my customers to be able to pay with a thousand yen bill, and still get some change back," says Ishizuka, who creates restaurants that specialize in serving quality food at an affordable price. All four restaurants are located on the 2nd floor of the Carnival Park. If you want to throw a party in a nice, relaxing atmosphere with fine cuisine at an affordable price, 'Papa Karin' located right by the Sunabe seawall is the place to do it. 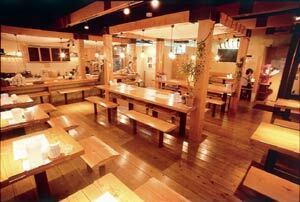 This restaurant and bar serves a variety of delicious izakaya-style dishes, and is open for reservations only. Another restaurant including in the Karin Restaurant Group is 'Palm Springs' in Hamby. Serving affordable French cuisine, they offer an awesome "Mini French Course." This ¥980 course comes with an appetizer, soup, salad, a main dish of meat or fish, a drink and dessert. All Karin restaurants will have a ¥100 Orion draft beer special from April 24th through May 8th. Steak Karin, Curry Karin, Pasta Karin and Japanese Karin are open 11 a.m. - 11 p.m. (2nd floor of Carnival Park). Papa Karin is by reservations only at 098-921-7139, and is located by Sunabe seawall. Palm Springs is open from 5 p.m. to 5 a.m. and is located on the top floor of the building across from Castle bakery on Hwy 58 in Hamby.